Walking into Strange Matter Coffee Co., a wholesome vibe paired with soft alternative rock playing overhead embodies the tan foam designs in their coffee. 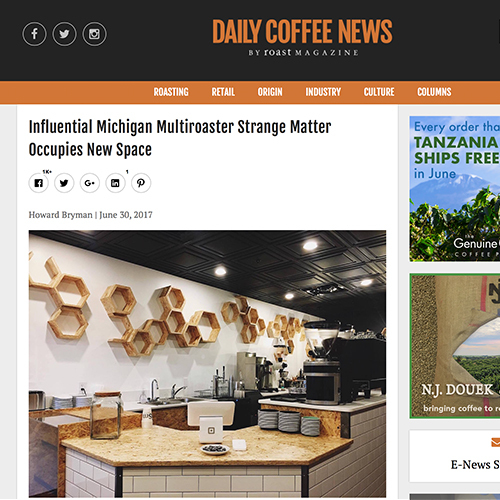 Strange Matter Coffee Co. is located on 2001 E. Michigan Ave. in Lansing. The urban coffee shop was started by owner Cara Nader, who received help from a Kickstater campaign and many others to make her coffee shop come to life. I have super exciting news! I have a new studio & office space! It’s called Create. It’s a space to create, learn, and grow. Create means to bring something into existence. I’m so passionate about creating. Not only for myself, but teaching and helping others to create. Besides being my office, and studio space, I’ll be teaching photography classes, and guitar lessons here. I’ll be sharing more information about classes, and lessons soon, but for now, check out my new space! Form meets function with these inspirational furniture projects crafted from community trees and featured in the Urban Wood Products Showcase, a popular component of the March 18 Bringing the Urban Forest Full Circle Conference at Hamburger University in Oak Brook, IL. The event was organized by the Illinois Wood Utilization Team.